The weather has been cool with the daily threat of showers up until today and though it was around 6ºC during the night this afternoon was a lovely summer day with the comfort of a little air conditioning. 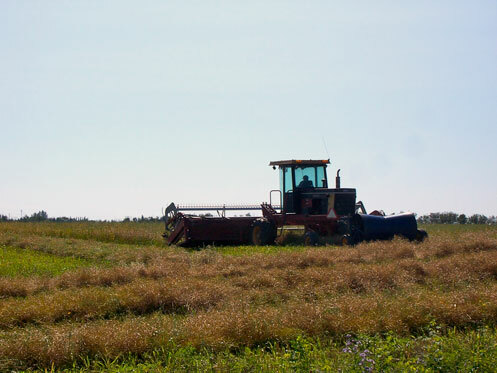 Though some wheat and barley crops in the immediate Tisdale area are looking very much like its time for harvest it was Canola fields that are drawing the first swathers their way. This spotting and short crop is on the west side of highway #35 just north of Tisdale. 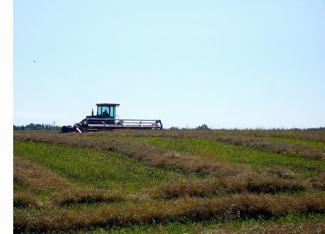 In just a few minutes driving I came across two other fields of Canola that had a few rounds of swath laid down. 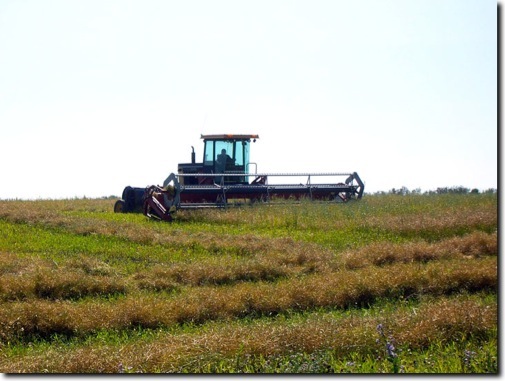 With hot late August temperatures expected tomorrow and sunny warm days expected for Friday and Saturday we can expect to see more and more activity out in the few fields that have seeded crops. Many fields between Tisdale and Melfort have already been worked up as either no crop was planted or this year's crop was destroyed by the heavy rains. I have seen two fields that have new green crops of what may be winter wheat or fall rye coming up.